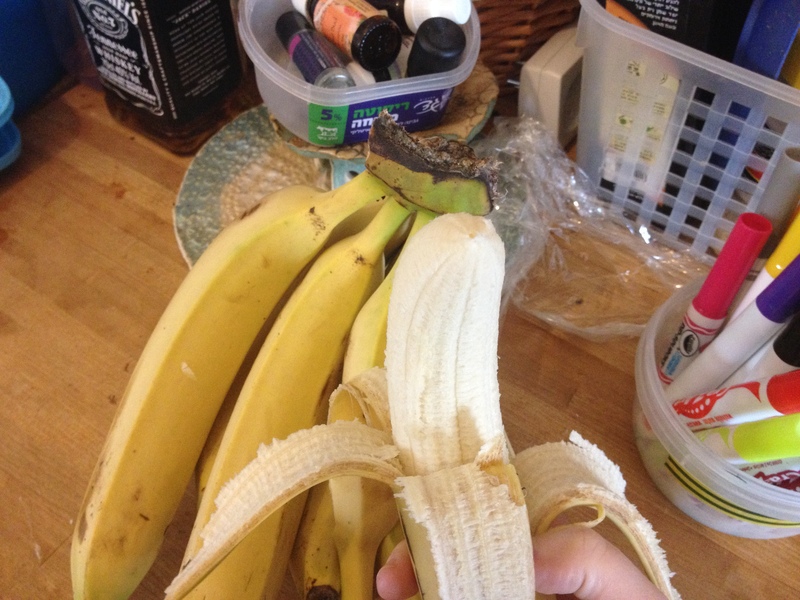 Shmita, or: Holy Bananas, Batman! Because of how hectic things were for both of us around Rosh Hashana this year I never got a chance to tell you about what makes this Jewish year so special. You know, other than the fact that it’s a lovely palindrome (5775). I know I have mentioned in the past (and I’m sure you have no recollection whatsoever) that there is a whole category of commandments that have to do with the land of Israel and its agriculture. (In Hebrew, mitzvot hatluyot ba’aretz.) But for two thousand years, there were no Jews working the land. The Jews who had been living here throughout history, in Jerusalem, Hebron, Tiberias, and Safed, were not farmers and lived mostly off of donations from Jews in the diaspora so they could study Torah full-time. As a matter of fact, no one was working the land for the most part. It was basically an infertile wasteland. When Mark Twain visited Israel in 1867 he described it as “a desolate country whose soil is rich enough, but is given over wholly to weeds… a silent mournful expanse…. a desolation…. we never saw a human being on the whole route…. hardly a tree or shrub anywhere. Even the olive tree and the cactus, those fast friends of a worthless soil, had almost deserted the country.” It is said that the Land of Israel only blossoms when the Jews are tending it, and whether or not you believe these prophecies, historically, this appears to have held true. In any case, when the Jews began to return to Israel in the 19th-20th centuries and tend the land again, it had been 2,000 years since the last time the commandments relating to the Land of Israel had even been relevant. Just like the revival of Hebrew, calling these commandments “back from the dead” and suddenly implementing them in a world completely different than the one in which they were last observed was quite a challenge. The most challenging of all, is the commandment of shmita. Shmita is that seventh year. (This year!) We’re not allowed to engage in our usual agricultural activity for profit. We’re allowed to tend plants to make sure they don’t die, but we’re not allowed to do things that improve production. And all plants must be hefker–public property. We must leave the gates open and anyone who is hungry may come and take whatever he wants. Anyway. As with everything in halakha, things are not nearly as simple as they first appear. And especially given the universal halakhic concept of pikuach nefesh–according to which we are allowed to transgress almost any commandment if it endangers a life–and the fact that civilization has changed so dramatically in the way food is produced and distributed in the past 2,000 years, some creative solutions have been required to address this mitzvah. Rabbi Avraham Yitzchak HaCohen Kook, the first Ashkenazi chief rabbi of the British Mandate, came up with a temporary solution that is similar to the “legal fiction” we use to solve the problem of businesses owning chametz on Passover (…don’t worry, we’ll get to that in a few months. 😉 ). Shmita only applies if the land is owned by Jews. Therefore, he proposed, the Jews could “sell” the land to a non-Jew, so it is technically owned by a non-Jew, and then work the land as usual. At the end of the year we would buy the land back. This solution is known as heter mechira, and the reason it is temporary is that it only works while the commandment of shmita is considered rabbinic and not Biblical. That is, it’s Biblical, but only applies as a Biblical commandment when a majority of the nation of Israel is in the land. That is not true yet, but it may apply already in the shmita following this one, given our population growth and the shrinking Jewish populations in the USA and Europe due to assimilation and emigration to Israel. So there are two other solutions. The first is the one that the ultra-Orthodox tend to use, because it avoids the entire issue of dealing with shmita: using only produce grown outside of Israel, or grown in fields that are owned by non-Jews. The second, and the one that I favor, is something called Otzar Beit Din. I can’t get into the details of how or why it works, but here’s the general idea: it takes advantage of the loopholes in the law to continue to grow, harvest and distribute produce (in ways that are different than usual, and therefore permitted) using a special alternative system. This year, this type of produce is sold at our local grocery store. And the special thing about it, is that produce grown in Israel during the shmita year has a special status: it is endowed with kedushat shvi’it, the “sanctity of the seventh year”. Just as this produce must be treated differently in the fields, it is treated differently in our kitchens. We are only allowed to prepare it in a way that is accepted–so for example, we’re not allowed to cook vegetables that are generally only eaten raw (like, say, cucumbers), or eat vegetables raw when they are usually eaten cooked (like, say, sweet potatoes). 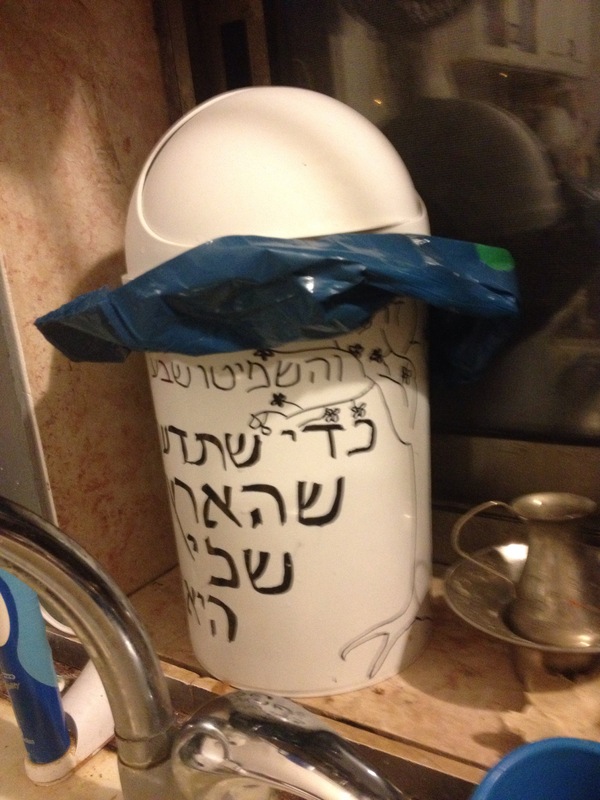 We are not allowed to throw it away or damage it purposely in any way while it is still edible, so we have a special garbage pail for only kedushat shvi’it fruits and vegetables, where we put scraps and stuff and only throw away when they have rotted on their own. Yes. I decorated it. What? Don’t mind if I do. Mmm, sanctity.